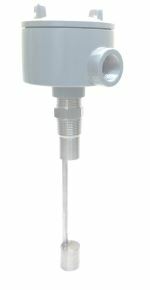 The Ultrasonic Point Level System 1670 Series is an ideal solution for detecting the interface level of two non-homogenous liquids, or the interface level of solids suspended in liquid. The probe is constructed in 316LSS material. The electronic module is captured in a plastic cassette and is mounted in a NEMA 4/ 7 explosion proof housing. An LED indicator on the electronic module offers a visual status of the system. Field selectable Fail safe allows for the relays to be energized on power up or in normal condition to close when liquid is present. A Demand Push button self-test feature on the electronic module assures the user the system is functioning correctly. The 1670 Series unit consists of two piezoelectric elements mounted in the housing of the sensor. These elements convert mechanical energy in the form of high frequency sound to electrical energy and vice versa. They are mounted parallel and opposite each other across the 6” gap of the sensor. The sensor is normally mounted horizontal in the application. Sound waves are transmitted from one side across the gap of the sensor to be received on the other side. Thin or clear liquids exhibits less attenuation than do viscous liquids, emulsions or liquids with entrained solids. The control unit senses the change in the percent solid in the liquid bymeans of the attenuation of the sonic energy being transmitted through the liquid. This attenuation is detected by the control system, the amplifier gain adjustment in the control unit is set so that the relays energize only when the suspended solid is within the path of the ultrasonic signal of the sensor. When the interface of two non-homogenous liquids is to be determined, the sensor is mounted horizontally at an angle of 10°, this is to break the beam of sonic energy unit is set so that the relays energize only when the interface is within the path of the ultrasonic signal of the sensor. Delay (on): 0.5 seconds Standard.